I made this graphic for the intro screen of my Build "test" game. On 03/07/2018, Do not hesitate to check out BUILD2! The Build engine, upon which Duke Nukem 3D was constructed, went on to become the most successful engine in terms of number of games released, a record still maintained at the date of this writing (May, 1999), with 12 published games. Notable games developed using the Build engine include Witchaven, TekWar, Shadow Warrior, Blood, PowerSlave and Redneck Rampage. I bought a new computer a few days ago. It came with Windows XP. That means a lot of my old programs that used to work on Windows 98 don't work anymore. I didn't want to reinstall Windows 98. If you have the game installed in a different directory, then you need to modify step 2 so it has the correct directory. NOLFB will only fix DOS VESA 2.0 applications that have a fallback code that supports the segmented video modes (from VESA 1.2). If the application does not run in segmented video mode, then it will exit with a visible error message instead of a black or jumbled screen. NOLFB does not add any new VESA modes to your computer! In fact it does just the opposite. If your graphics adapter does not support standard VESA modes (such as 640x480x8) in any DOS application, then this patch will not help you. Some newer video chipsets (most notably those based on the GeForce4 series) do not support VESA with resolutions above 640x480 under Windows NT/2K/XP. I believe this is due to a conflict between the VESA driver and the operating system and not NOLFB. If your monitor goes into a standby/power-off mode, and you are using a resolution above 640x480, please remember to also try 640x480 mode! Here's a list of programs I've tested that are fixed by this patch (assuming the above conditions are true): Duke Nukem 3D, Shadow Warrior, most of the Build engine tools, 2Draw, and some demos on my website that are linked to my DOS VESA code: "VES2.H". NOLFB will not do much in Win95/98/ME other than cause the framerates to decrease in games. Use at your own risk! Episode 1, Level 4: Crashes immediately! I made a little program that fixes this problem. It disables the "echo" effect by modifying some bytes in DUKE3D.EXE. This patch works for v1.3D (shareware & registered) and v1.5 (Atomic Edition). If you are patching v1.3d (registered), please be aware that this will require you to reinstall from the original CD if you purchase the Plutonium PAK at some point in the future. DUKSNDFX.EXE (5,654 bytes) Please save this program to your Duke3D game directory and run it from there. DUKSNDFX.C (5,167 bytes) Source code for hackers. If your version is not listed here, UPGRADE NOW! This program supports ONLY version v1.2 (shareware) and v1.2 (registered) None of the 3dfx versions are currently supported. As a side effect, reverberation will be disabled. If you'd like to make your own patch for a version of Shadow Warrior not supported, look at the instructions at the top of my C file. SWSNDFX.EXE (5,634 bytes) Please save this program to your Shadow Warrior game directory and run it from there. SWSNDFX.C (5,537 bytes) Source code for hackers. These are only some of the highlights. I put the dates I found to be most crucial in the development of the Build engine in this list. The history includes everything from business deals to important features that were added to the engine. Some of the dates were quite hard to find - I had to search through old records to find evidence. In any case, it was a lot of fun to make this list even though it took a whole day out of my life. 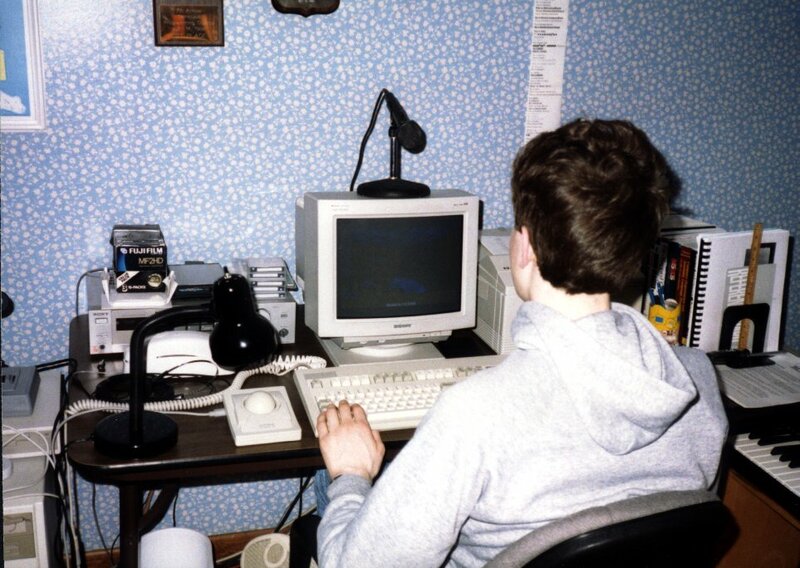 06/09/1992: Ken's brother, Alan, hogs the computer by playing a new game titled "Wolfenstein 3D"
10/03/1992: I change the name of the game to Ken's Labyrinth and it is coming along well. My dad convinces me to write to 6 software companies to ask them to sign an NDA to review Ken's Labyrinth. I suggested we add Apogee Software to the list even though they already had the Wolfenstein engine. 10/10/1992: Scott Miller of Apogee Software signs an NDA to evaluate Ken's Labyrinth. As a nice gesture, he includes a registered copy of Wolfenstein 3D. 10/27/1992: Not being satisfied with the responses from the first round of letters, I send letters to 9 other software companies. 10/27/1992: Scott Miller sends a sample shareware contract, showing how their developer rates are generous compared to a typical retail game company. 11/22/1992: I send Scott a 2nd version of Ken's Labyrinth to evaluate. 03/06/1993: Write short Quickbasic program to display the recently released pre-release screenshots of Doom (custom .LBM files). 03/29/1993: "picrot4.bas": My first attempt at a new style of 3D engine which supports angled walls like in Doom. Since I had no editor, the map was typed in manually in the code. Ceilings & Floors were a solid brown color. 03/30/1993: Scott Miller sends a letter congratulating me on the release of Ken's Labyrinth. He proposes doing a new release of the game through Apogee but with a complete redesign of everything (except for the core engine). He also talks about my desire to write a Doom-style engine (I may have mentioned it during a phone call?). He points out how Id Software is not licensing their Doom engine (at least not at this time). 04/06/1993: Ported "picrot4.bas" to C using the Ken's Labyrinth wall drawing assembly code: "picrot4.c" PICture ROTation demo #4 (22,842 bytes) Some people have asked for picrot4.bas, so here it is. The date of the file should say: 03/29/1993, but doesn't because I converted it to text so it would also work in Qbasic PICROT4.BAS (8,125 bytes) Keep in mind that this code is really old, buggy, and not representative of my current work. 08/13/1993: On a family trip to Toronto, Mark Rein of Epic Megagames makes a proposal for Ken's new engine (unsuccessfully) Many years later, this is what Mark had to say about it. 08/24/1993: Ken signs employment agreement with Apogee Software Productions. A special provision on the contract says that Apogee cannot interfere with Ken's education. 11/? ?/1993: Ken impresses his CS15 instructor, Andy van Dam (also co-author of the popular book, Computer Graphics, Principles and Practice), by offering him engine demos of Ken's Labyrinth and the latest Build engine. He doesn't get impressed easily! 02/06/1994: Started "Build Revision History" text file. From this point on, the history turns into mostly engine features. 03/? ?/1994: Here's a nice candid photo (150k) of me in my Rhode Island "office". Pictures are worth a 1000 words: see how many objects you can identify! 04/07/1994: Here is an early snapshot of the Build Engine distribution: Build_Apr1994.zip (515,806 bytes, 02/08/2008) At this point, the editor and sample game are looking a lot like the final version. Of course it's missing many of the bells & whistles which were to come. Note: I removed the Doom guy (used only in serial link mode) and 1 wav file to avoid copyright issues. 04/24/1994: Added "fake" LOOKING UP & DOWN after discovering that it wasn't too difficult to shift the screen up & down. 3 days later, the same effect mysteriously appears in Apogee's other game that they were working on at the time, ROTT. What a coincidence! 02/26/1995: Rewrote network code to send movement packets at a constant interval. Since movements were no longer calculated once per frame, interpolation had to be added to keep the frame rate smooth. During the development of the Build engine, I spent over half my time in Rhode Island (my homeland!). I went on a total of 10 "business" trips from 1994 to 1996. The Apogee/3DRealms office (which is located in Garland, Texas) was a destination to all of these flight paths. I also visited Redmond, Washington a few times to help out the Blood team (and also Lobotomy software when they were still working under the Apogee/3DRealms name). So, how much time exactly did I spend away from home? Any game programming in your future? (07/15/2000): I'm playing around with a new voxel engine, but I don't know if I'll get anywhere with it. Right now, it supports voxels placed anywhere (built-in room over room), look anywhere (6 degrees of freedom), and some basic editing functions. Do you still do any 3D programming? As long as I'm alive, I'll always be doing some kind of programming. I have many programming interests besides 3D graphics: 2D graphics, sound & music, utilities, games, compression, and of course optimization. 3D graphics will always be very high on my list. How do I get started in 3D programming? Know your math! For 3D engine programming, you will need to master: algebra, trigonometry, and geometry (feel free to sleep through calculus). You also should learn how to manipulate vectors, such as dot and cross products. Get a 32-bit C compiler so you can generate fast code quickly. Often times, you will find it difficult to debug your C code (even worse for assembly). In these cases, you should develop small sections of your code in a programming environment that you're more comfortable with (and port it to C later). For me, that's good old Microsoft QuickBasic. Spend all of your spare time reading, studying, and thinking about computer algorithms. Warning: This will put your social life at risk! Do this ONLY if you're willing to accept the consequences. How did you hook up with 3D Realms? Look at my Build history. Our first contact was the letter I wrote to them, asking for them to evaluate a beta version of Ken's Labyrinth. They were one of seven companies I wrote to at the time when I was trying to find a publisher for my game. How long did you work on the Build Engine? It all depends on how you define "work". Judge for yourself by looking at my Build History. Obviously I wasn't working on it continuously, but I did spend considerable amounts of time and energy for almost four years. Are you any good at multiplayer games? What's the .MAP / .ART file format? Go to my Build Source Code Page and download BUILDSRC.ZIP. I have a text file in there (BUILDINF.TXT) which describes both formats. See this separate PALETTE.TXT file which explains it all. What's the TABLES.DAT format ? See this separate TABLES.TXT file which explains it all. What's the .GRP file format? The ".grp" file format is just a collection of a lot of files stored into 1 big one. I tried to make the format as simple as possible: The first 12 bytes contains my name, "KenSilverman". The next 4 bytes is the number of files that were compacted into the group file. Then for each file, there is a 16 byte structure, where the first 12 bytes are the filename, and the last 4 bytes are the file's size. The rest of the group file is just the raw data packed one after the other in the same order as the list of files. What's the .KVX file format? Go to my Projects Page and download SLAB6.ZIP. I have a text file in there (SLAB6.TXT) which describes the format. What's the .VOX file format? read(fil,voxel,xsiz*ysiz*zsiz); //The 3-D array itself! In the voxel array, use color 255 to define your empty space (air). For interior voxels (ones you can never see), do not use color 255, because it will prevent SLABSPRI from being able to take advantage of back-face culling. How does SLABSPRI convert images to voxels? It starts out with a solid cube. Then it runs through all of the rotations, chopping out any voxels that lie behind a transparent pixel (color 255). Once this is done, it runs through all the rotations again, this time painting colors onto the voxel object. If an individual cube is painted twice, the colors get averaged. Voxels that don't get hit by paint get randomly set to a nearby color. What is a voxel? Where does the name come from? VOXEL = VOlume + piXEL. You can think of a voxel as a pixel with volume - a 3D pixel. It is an individual cube inside a 3D array of cubes, just like a pixel is a square inside a 2D array of squares. I actually got the name out of an old computer graphics book. In Build, when I go into 3D mode the screen is jumbled. What am I doing wrong? Wow! You're the first person to ask this question. That's why it's in my FAQ. Wait a minute... how could it be in my FAQ if you were the first... that doesn't make sense! Please read the text files that come with the game and stop asking this! Do you have an old Build editor which can edit Lameduke (map version 5) or Witchaven (map version 6) maps? If not, then do you have a way of converting between the formats? What about supporting Legend of the Seven Paladins (map version 4)? Have you made any maps for Duke3D? No, only maps for Ken-Build. Is there a way to increase the limits to the number of sectors, walls, and sprites in BUILD? Yes, but since it's hard-coded into the engine, the only way is by doing a re-compile. Can you answer my question about .CON files? No! I had nothing to do with the design of the .CON files. They were designed by Todd Replogle, for use with Duke Nukem 3D. This is why you don't see them in Shadow Warrior or Blood. However with many of the sublicenses, Apogee/3DRealms gave out the Duke Nukem 3D source along with the Build engine. This is why you see it in some other games. How do you pronounce Todd Replogle's last name? He used to say it this way: "Ree-ploh'-gull". Then later, he told me it was: "Rep'-low-gull" (accent on 1st syllable), explaining that he used to mispronounce his name on purpose (just to confuse people). I'm still not sure which is right. Can you release a version of Duke Nukem 3D with features that were in newer Build engine games? Some features wouldn't be difficult, such as voxels because 99% of the code was part of my Build engine. Other features like room over room were added by individual developers - so that would take a lot longer for me. The hardest part of any update (if I had to do it all myself) would be to find the right places in Todd Replogle's code. I haven't looked at his code in a long time. But all this doesn't matter because I haven't been keeping in regular contact with Todd. And even if I did get it working, I would have to seek permission from 3DRealms. I have a problem with a tool that is unique to Blood. Can you help me? No, probably not. The Blood team wrote a lot of custom utilities for themselves and I just don't remember what most of them do anymore since I have my own tools that do much of the same thing. Why does BSETUP have all those extra options that don't get used for anything? Some of those extra options are used in my Build test game: "Ken-Build"
I have no life, and for fun, I was looking through Duke Nukem's BUILD.EXE with a hex editor. I noticed that there were some VERY interesting messages that never seem to appear inside the editor. This is one of the few things in BUILD.EXE that I can't take credit for. Allen Blum made this modification to make his job even more interesting. In his code, the messages were disabled from displaying, but he forgot to also remove the message declarations themselves. A different message would pop up depending on what the current frame rate of Build was. "Slow" meant just over the line, and as the frame rate of Build got progressively worse, so did the messages. Can you help me solve a problem with conflicting IRQ's / DMA's? Is your sound patch supposed to fix this? Please don't ask me this. I don't install computers for a living. I usually have to resort to good old trial and error to get stuff like this to work. About the sound patches: They only fix a crashing bug inside the game when you walk into certain places that have the "echo" effect. My patch WILL NOT help you if you can't get the sound to work at all. Will you be making a sound patch for Blood, Redneck Rampage, and the rest of the Build games? Grrr... I have to draw the line somewhere. Blood - it might happen, but don't count on it. I don't even have copies of the others, so you can forget about those. You must realize that this problem is not even in my code. Apparently, there is a conflict with Jim Dose's echo routines and newer sound cards. It's not fair to blame him since these new sound cards didn't exist back in 1996. I don't know why it crashes. Just consider yourself lucky that I was able to make patches for Duke Nukem 3D and Shadow Warrior. Are you going to release the Build Engine source code and if so, when? What programming languages are you familiar with? Basic (Microsoft QuickBasic 4.5), C (Watcom C/C++ v11.0, Microsoft Visual C/C++ 6.00), and x86 assembly language (16-bit, 32-bit, MMX, and Pentium III instructions). I use all 3 of them regularly. I first develop algorithms in QuickBasic because it has a great debugger. When I'm satisfied, I then port the code to C. The final step is converting some critical parts of the C code to assembly. What C compiler do you recommend? I recommend Microsoft Visual C because it's the industry standard... and also what I use for current projects. I used to use Watcom C when it was the only 32-bit compiler. I had lots of trouble finding example code for it because it was not so popular. Thankfully, everything is 32-bit these days. You'll save yourself a lot of trouble in the future by starting with a popular compiler. As for optimization, I've heard good things about Intel's compiler, but it's expensive and I've never tried it myself. How do you program games? By typing things on a keyboard. I love my Key-tronic 101 and wouldn't trade it for the world. Do you answer your E-mails or are you just too busy? I try very hard to answer all my E-mails. If you're really looking for no response, then all you have to do is go on and on about how "U da' MAN", ask no questions, and while you're at it, throw some exclamation marks all over the place!!! That should do the trick. Do you use IRC or ICQ? I used IRC a few times around the time of that Dukeworld interview, but haven't been back since then. ICQ: never used it. I also used AOL Instant Messenger for a while. Nowadays, I use Skype. Is it ok if I mirror a part of your site onto my own site? Yes, but only if you provide a link back to my site and are willing to update yours often enough - by that I mean that you should check my site for updates every once in a while. I hate having old stuff just lingering around. The first thing I plan to do after graduation is to lose all my wisdom. Oops, I omitted a word - I meant to say: ...lose all my wisdom teeth. :( Assuming I survive that (which I did BTW), my plans are: #1. Take over the world #2. Ok get the point, Ken: I have no plans right now. Do you have any regrets about leaving Apogee/3D Realms? Sure, I miss all the fun we used to have testing the game. The reality of it is this: the only way I could have maintained a future with Apogee/3DRealms is if I went into direct competition with Quake. At the time I was far behind, and I just wasn't interested in making a commitment with Apogee for several more years. (If you estimate the release date of Duke Forever, that would have been a lifelong commitment!) I thought it would be best if I returned to school while I was still young. 04/01/1998: An interview of me by the Brown Daily Herald. 11/29/1998: An interview of me by Brad Wernicke at (http://www.planetduke.com) PlanetDuke (originally at Dukeworld). 12/19/2001: An interview of me by Peter Bridger of (This/That) Strife (Streams). Also featured on Peter's page are his unique comic strips, which he made with the help of the Build Engine. 04/11/2002: An interview of me by Dr. Curween from the Doom Encyclopedia website. 07/20/2003: An interview of me by (http://www.dosgamesarchive.com>www.dosgamesarchive.com). 06/20/2004: An (http://eliteincorporated.org/Worlds/FPS/games/Ken's%20Labyrinth/interview.html) interview of me by Advocate of (http://firstpersonshooters.org) . 10/01/2004: An interview of me by Mike359 of (http://www.polarismapcentral.com) Polaris Map Central. 09/14/2005: An interview of me by (http://cppjunky.online.cx) CPP Junky. 11/21/2005: An interview of me by Classic DOS Games. 12/03/2005: An interview of me by Peter Bridger of (This/That) Strife (Streams). 10/23/2008: An interview of me by Tcerhnobog of the Blood Wiki. 05/01/2017: An interview of me by Arcade Attack. Find out more about these games from the company that was in the middle of it all: Apogee/3DRealms. I made a "What is the Build Engine? FAQ" to clear any confusion about what my role was during its development. Jonathon Fowler's Build engine page- A compilation of all the Build games onto one site, with screenshots and download links for each game. His site is also home to a great Windows port of Build and Duke Nukem 3D.